Compton Mackenzie’s story in turn was based on a real incident when an 8000 ton cargo ship, the SS Politician, left Liverpool, England, in February 1941. Among other goods, she was loaded with whisky for export to the USA. On her course along the west side of Scotland to join an Atlantic convoy, she was caught in a gale and ended up aground in the shallow channel between the islands of Eriskay and South Uist in Scotland’s Outer Hebrides. The locals quickly got to hear what was in her holds. The island at that point was ‘dry’, because of wartime restrictions. As word spread, they came from many of the islands to ‘liberate’ the cargo, as well as outwit the Excise who were sent to ensure the whisky was safely recovered. In the real event, several island men were fined or jailed for looting. In the book and film(s), the affair has a more whimsical air, rooted in the locals' attitude that the sea has provided and they have a right to salvage. 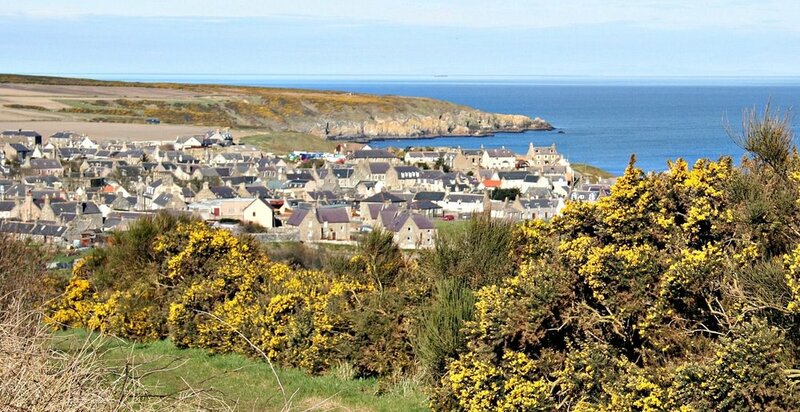 Portsoy and its harbour. 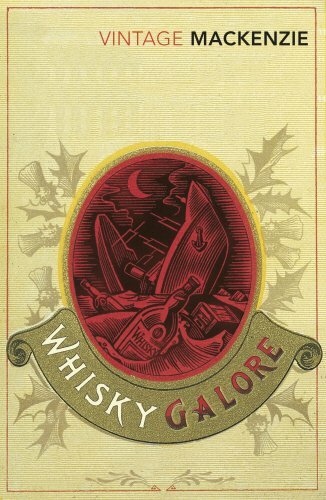 The waterfront features in several scenes in the new Whisky Galore. Looking west from Portsoy. Early in the year, so it isn't even very green yet. Attractive? Probably. Hebridean? Not in the slightest. But does that matter? 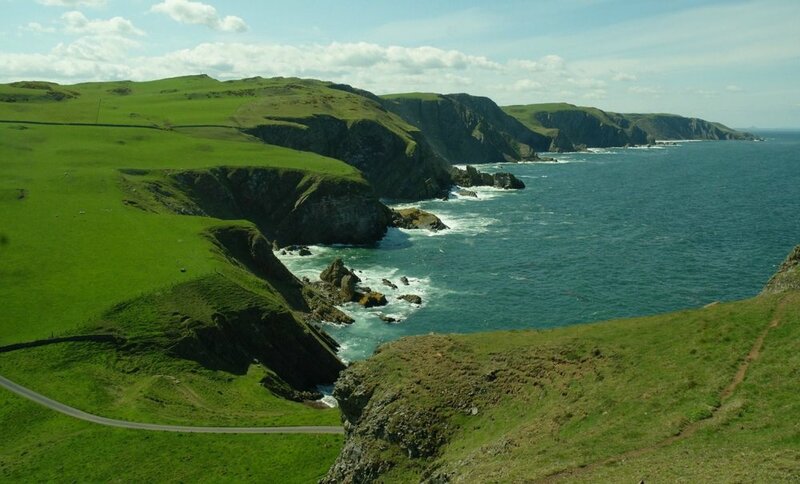 Looking up the coast from St Abb's Head in the Scottish Borders. It's green, green, so green! The lighthouse access road, bottom left, was used for the chase scene where Captain Waggett follows the islanders' whisky-laden lorry. OK, so the scenic background is quirky and conveys no real sense of a Hebridean setting. That has been left for the actors and their accents. But does it work as a re-telling of a fairly well-known tale? Probably. At its core are the differences in culture, attitude and values of two different kinds of people - the islanders and the ‘authorities’, symbolized by Captain Waggett. Waggett stands here for the kind of incomer or ‘blow-in’ absolutely convinced that his ways are the only way and that it’s simply a matter of educating the locals. Ironic how Mackenzie was satirising this back in 1947. Nothing much has changed in contemporary Scotland. Hebridean blue (or is it green?). Looking east down the Sound of Eriskay, where the real wreck happened. See also picture below. The plot unfolds much as in the original, apart from a curious (and not really necessary) sub-plot involving a confidential attache case containing letters from the Nazi-sympathising abdicated King Edward VIII and his fancy-piece Wallis Simpson. The new Captain Waggett is more like the 1949 film version than the character in Compton Mackenzie’s original novel, where, though his pompous superiority is satirised, there is no ‘revenge’ or come-uppance for him - the factor that makes the screen play more satisfying! 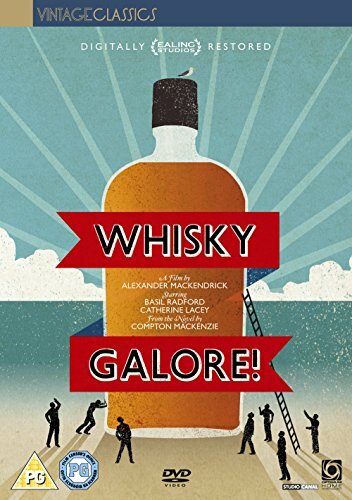 Will you enjoy the new version of Whisky Galore? So, Is it as good as the original? I'm tempted to say no. But It’s just different. It’s a re-telling. It’s for a different audience. It’s for younger people probably. 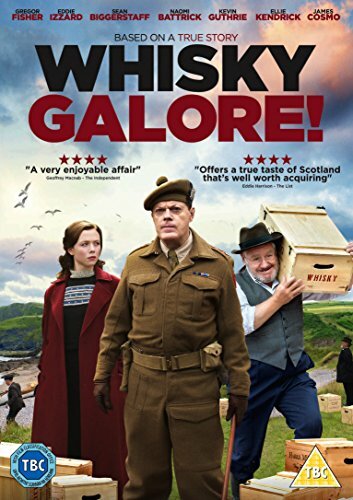 Personally, I prefer the 1949 film for its vitality and its soundtrack - and for the way it captures the sense that native Hebridean folk do things in their own way. But I prefer the ice-cream in Portsoy. 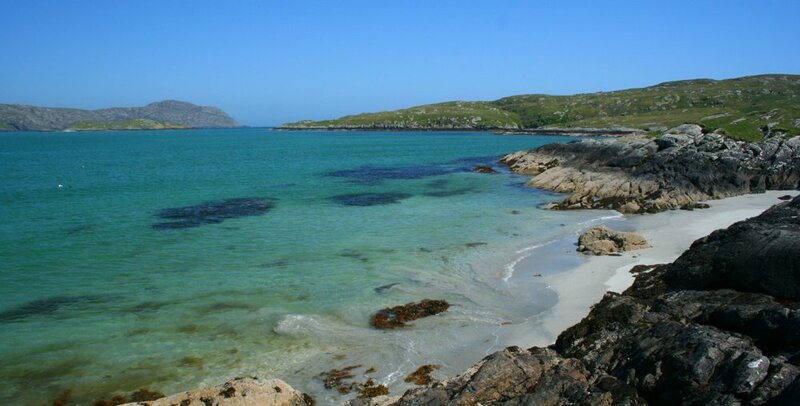 In this view, little Calvey Island lies in the sound between Eriskay (from where the pic was taken) and the south end of South Uist. The morning after the grounding, according to witnesses, a ship’s boat was launched and drifted north onto the hazardous steeply shelving rocks at a spot opposite Calvey, just left of centre (and marked as Rubha Dubh on OS maps). Miraculously, all the crew got ashore, and the Eriskay ferry promptly rescued them. What really happened to the wreck of the SS Politician? Follow this link for a picture of the wrecked SS Politician, courtesy of the Merseyside Maritime Museum. What is striking is how high she sits on the reef - it must have been quite a shock to the Eriskay folk to find this huge vessel looming offshore. She lay there till September 1941. Finally the salvage team got one half of her away for scrapping. The other half of the vessel was towed further into the Sound of Eriskay where she lies, just below the surface, to this day. Sometimes, the Eriskay ferry would divert to give visitors a view of the submerged hulk - but there is a causeway today and no ferry runs!